A data broker plugin that shows world quests in list form, so you can quickly find the ones that are worth doing. This addon does nothing on its own! You NEED to have a data broker addon like ChocolateBar installed! Highly recommend using it together with Better World Quests. Latest version can always be found in the github repository. - Added basic TomTom support. Clicking a row will set this quest as waypoint. - added level 120 zones, rewards, factions.. 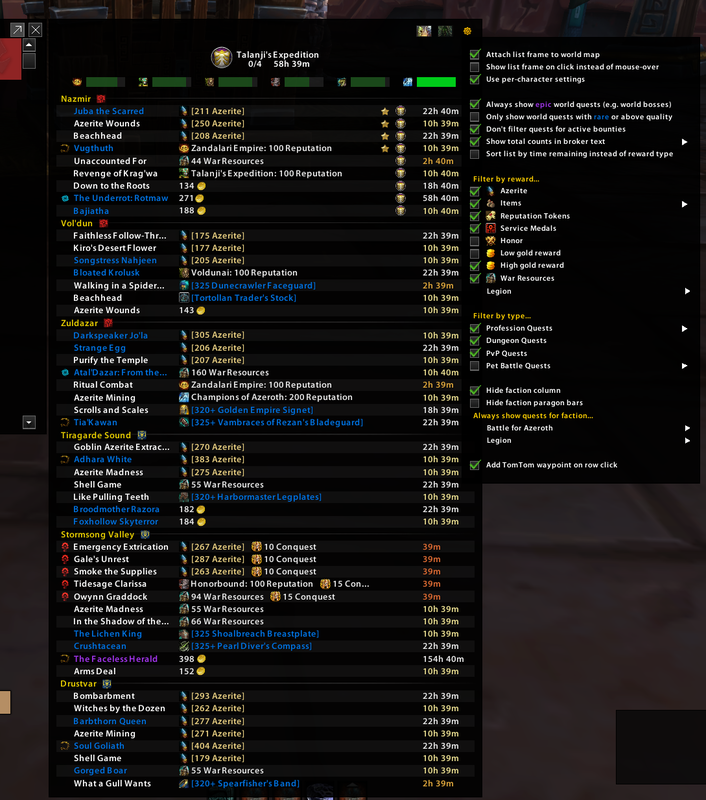 So I went through the WorldQuests.lua file and commented out lines 1028,1029 and the block 1056-1075, this ends the error but I suspect there's more to it than that though as the emissary bounty doesn't show now. I'm getting the following errors with only my broker display, Bugsack, Buggrabber and Broker_Worldquests. It happens with the cursor over the emissary area at the top of the list. Re: Re: Re: Error still. I'm trying to think where I expanded the collapsed BFA areas, I think I was in Boralus before switching the expansion back to BfA and choosing which quests I was going to do. Hopefully the BugSack log is more helpful than my memory but I'm pretty sure that's the correct timeline. Edit. It happened again when going to Vol'dun from Boralus. Hopefully you can reproduce that. Was not able to reproduce that but the error shouldn't pop up anymore. I'm still getting the Legion zones not showing the quests correctly, I grabbed an image for you. You mean the grey ones? That's when they are hidden, you can make them visible again by clicking them. Maybe I should add a little indicator to them to make this clearer that zones can be collapsed. Oh! Well that's a der for me, not so cluey after all. I'm sure I'd clicked on them before though. I'm guessing the WQ rewards will be an ongoing thing as they look like they're here to stay. For now I'll try and remember to check, I remembered the other day and did them on one character, logged out to have dinner and when I logged back in I forgot to go with my other characters! I just got this error after loading into Vol'dun from Boralus. (*temporary) = "attempt to perform arithmetic on local 'current' (a nil value)"
No errors when I logged in or while I bounced around doing Xmas stuff. The last port to Vol'dun gave that error. Last edited by Cluey : 12-24-18 at 08:16 AM. Out of interest how easy would it be to flag some quests to show when they're up without going to find them? Say a section at the top/bottom of the list of Quests you're following so we can see when the WQ are up for the toys/mounts we're missing from the Argus rares? That's a neat idea. Not quite sure if it would have any use outside of Argus quests though. It would also take a bit of time to implement something like that. For now maybe a combination of the new expansion quick-switch buttons + collapsing all the other zones could make it faster to find them? Perhaps it's not doing it for you? Last edited by Cluey : 12-23-18 at 11:49 AM. Error is fixed in 8.1.55. Blizzard changed the way expiration time on some quests is reported to fix their own issue with them, which in return caused mine to fail. Regarding automatic switching etc. I'm not really a fan of. I know WorldQuestList does it this way if I remember correctly, but personally I always found having a list of everything more useful. I'm assuming the Blizzard error is why a friend was asking me what he'd broken as his map wasn't showing the emissary time remaining, it wasn't showing for me either but I didn't care as I remember when. I think I play too much. I like the list of all the WQ too but right clicking to change the toggle and then mouse over the LDB display isn't great either. Perhaps a per character setting for it so the alts I haven't levelled yet don't get no quests? That's the example I'm thinking of as I forget to check as it's out of sight, out of mind. Last edited by Cluey : 12-22-18 at 12:25 PM. Any status on tomtom support? I greatly prefer your addon but have to run WorldQuestsList also because of its great tomtom arrow when you click the quest names. Always planned to, never actually pulled through to take the time to do it because I'm not using it myself, sorry I'll take a look at how complex it is after the holidays. Thanks for keeping this updated myno. I've noticed a couple of bugs/quirks and have an error I've been getting since grabbing version 8.1.51. 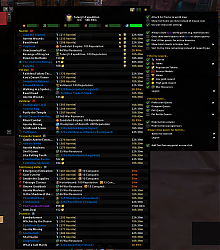 When looking at Legion data some of the zones don't list any quests at all. I've a suggestion for the Legion/BfA switch too. Can you default it to the area we're in? Even better would be for the LDB list to dynamically change based on which map I'm looking at, so if I'm looking at Highmountain the list will show Legion WQ. Not sure how hard that would be but as it hasn't been showing me the lists, after choosing the expansion, I've been looking via the map. I've got the option to open the map when clicking a quest turned off, that was the option which was throwing lots of errors for you back in Legion, it works perfectly when the map is already open though. Now the error. This happens when I log in but isn't giving an error with a reload, so perhaps it needs a longer delay before looking for quests? Submitted version 7.3.40 which supports the new content and should fix some issues with flight map and artifact power numbers. Thank you for such an indispensable addon! I was looking for a way to add a font outline but can't seem to find anything. Is it possible? Unfortunately there are no in-game settings for something like this at the moment, sorry.